We’re not just a camera anymore. We’re an enjoyment platform for people around the world to watch. Imagine if your audience enthusiastically took over your brand’s promotion. Engagement and customer retention/loyalty — two of B2C marketers’ top content marketing goals — would be through the roof. GoPro, maker of the high-quality, easy-to-use handheld video camera, is one the best brands at user-generated content (UGC). Senior Vice President of Marketing Paul Crandell’s leadership of his 149-member staff (up from 17 people in the early days) has helped GoPro to produce aspirational, short-form content that has inspired legions of customers to capture immersive footage of their adventures, which they share online. This massive growth in engagement is no doubt aided by Paul’s perspective — he’s seen fans move from taking static selfies to capturing self-adventure videos. In fact, the company’s public stock filing denotes the intention to become a media company. These are some of the reasons why Paul is a finalist for Content Marketer of the Year, taking top honors in the engagement category. The Content Marketer of the Year will be announced at Content Marketing World this month. 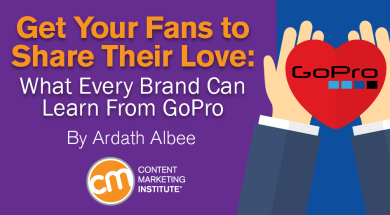 GoPro’s user-generated content success is inspirational — especially if you’re a marketer who wants to turn your customers into fans who want to share their experiences with your brand (yes, even a “boring company”). Before digging into what you can learn from GoPro, let’s take a look at how it approaches UGC. Not only do users post videos of their own experiences, but GoPro also buys the rights to self-shot videos with unique and inspiring content, polishes them, and posts them to its owned channels for additional distribution. By doing so, GoPro is inspiring others to believe that they, too, can “be the hero” by using a GoPro camera to record their experiences. The Washington Post created a video that showcases 16 incredible moments captured with GoPro technology. GoPro partners with more than 130 professional athletes, as well as musicians, to provide glimpses into what the experience might be like to be a professional skateboarder, snowboarder, rock star, or even a National Hockey League player. Paul built the sponsored athlete roster from 65 to 131 to include such names as Olympic snowboarder Shaun White and professional skateboarder Ryan Sheckler. He’s also struck a deal with the NHL to provide shots from cameras mounted on players’ helmets and face masks to let fans see what it’s like to score a goal. These videos inspire GoPro’s customers to go out and have more adventures – with their cameras rolling. The video below showcases a day in the life of skateboarder Sheckler. GoPro also formed partnerships with travel destinations including 17 Marriott hotels in the Caribbean and Latin America. They offer complimentary cameras to guests during their stays and encourage them to upload their GoPro pictures and videos to share their adventures. GoPro also sponsors the GoPro Mountain Games in Vail, Colorado, which attracts 3,000 athletes and 53,000 spectators annually. This video shows an adventure experienced by a couple at a Marriott resort in Aruba showcased on the Marriott’s Travel Brilliantly website. How can we position our brand to create a more enthusiastic user community? GoPro isn’t a camera company; it’s a platform for its customers’ self-expression of their digital lifestyles. Rethink your company’s value proposition around the perspective of your customers. Which complementary brand could be our partners? Just as GoPro has partnered with athletes and hotels, think about how your company can find creative ways to expose the value your products bring to new markets. How can we help our customers find their 15 minutes of fame? Reward your customers by encouraging them to create content about how they use your products in their lives, then polish it, and put them in the limelight by providing distribution beyond what they could get themselves. How can our brand tie the passions of our employees to the passions of our customers? Share the story of your employees to show that the brand story lives beyond the corporate messaging. GoPro employees are avid adventurers, sports enthusiasts, and users of the gear GoPro manufactures. That message resonates with its customers who are much like them. You just might want to take a page from Paul’s playbook by focusing on content that’s entertaining, lifestyle-driven, and emotionally engaging. And Paul feels the excitement, too. What’s fun about our content is that there’s something new online for us to consider every day that we walk into the building.